Oh I love Christmas. I really do. The lights, the family, the warmth, the present buying. It’s all wonderful thing. Christmas is also hectic. It’s running around, it’s trying to see everyone, and in my industry it’s Christmas baking for the masses and making cakes for Christmas parties, and this year there was also a huge winter wedding that required two wedding cakes just a couple days ago. Which has made this holiday season a little more crazy even than the usual. So this is a bit last minute, which is too bad, not only because it’s acknowledging my total break in organization, but it’s also dissapointing because this is one of my favourite in this line of Stocking Stuffers that my amazing friend Jen and I did together. I am not a coffee drinker. It kills my stomach and gives me terrible acid reflex, and it’s just generally a terrible idea for me. 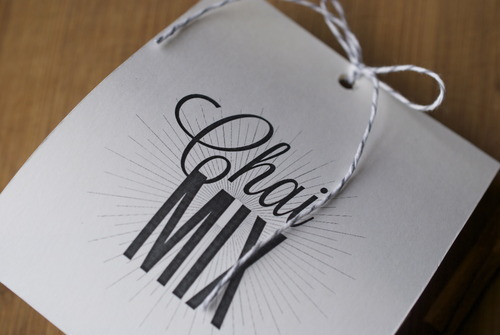 But when I was waking up at 4am to bake bread a few years ago I needed something that would give me a kick and wake me up that was just a bit more gentle on my belly, and that’s when I became obsessed with Chai. 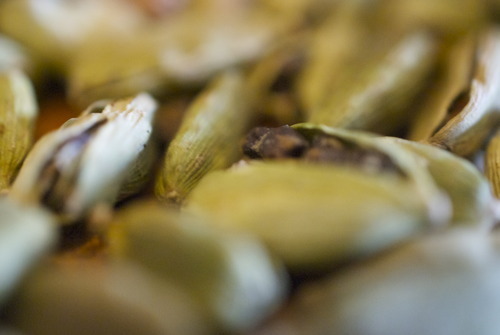 It’s a potent mix of flavours, the cardamon meddling with the cinnamon , balancing off the dark black tea, it’s a truly wonderful thing. Traditionally it’s served very strong and steeped in milk, but I will happily drink it black, and even, often, with soy instead of cows milk- because my sensitive stomach doesn’t like dairy much either. It’s the perfect thing first thing in the morning for someone like me. Once again Jen Cook has blown the packaging out of the water, these little bags are so charming and so easy I’m just blown away, as I have been every week as we’ve been making these stocking stuffers. So please, even if you’ve made all your Christmas presents already, make this as a gift to yourself, to keep you warm on cold mornings. In a small pan over low-medium heat toast the spices seperately, until they are fragrant but not smoking. Pulse them in a spice grinder until they are just broken up but not ground finely. In a bowl mix the spices with the black tea and then evenly put them into four bags. 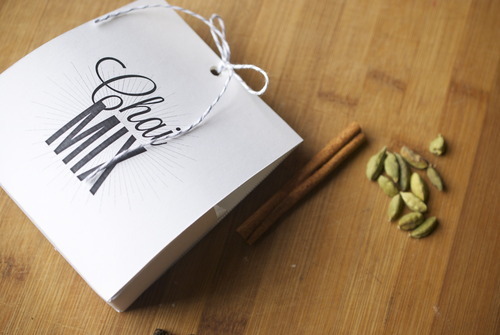 Tape the bags shut and put them into the boxes and give them out at will- or keep all the chai for yourself!